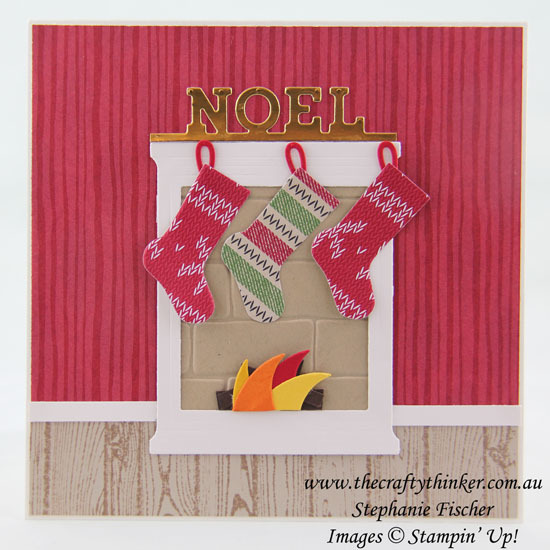 The Crafty Thinker: Stephanie Fischer - Independent Stampin' Up Demonstrator: Christmas stockings above the fireplace. Whilst I have aclimatised (as one would expect after more than 30 years! ), I'm still a little conflicted at Christmas time. Having grown up with wintry Christmases, I'm still drawn to the comforting and cheerful images of glowing fires, warm clothing, snowmen etc! I do now, however, associate summer with Christmas - although it took a few years. I used to get the urge to do my Christmas shopping at completely the wrong time of year and then end up in a mad dash to the shops at the last possible minute on Christmas Eve! Those days are gone! I apologise - I have just realised that the Woodgrain Background stamp is in fact retired! I am, however, struggling to believe that Christmas is almost upon us. I just don't know where the year has gone!